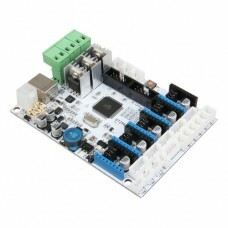 The GT2560 is a compact board that is integrated with the function of the Arduino Mega2560+Ultimaker and Arduino Mega2560+ramps 1.4 on respect of both software and hardware and has more premium features: the streamlined interfaces effectively avoid the unnecessary troubles, well-regulated compaction of components highly integrated saves more space and easier to be mounted on most applications. 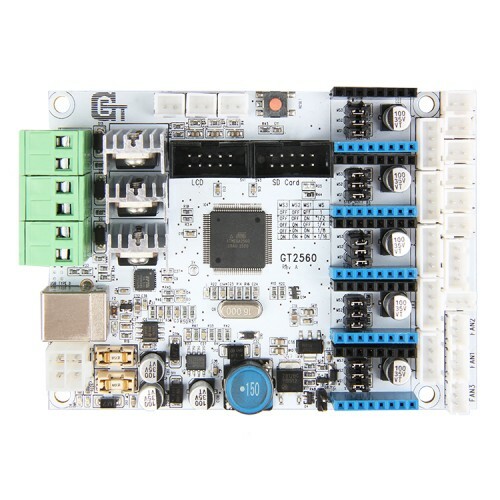 5 stepper motors, swappable driving modules, ATmega2560 processor with 256k memory, 16MHz operating frequency, high-performance USB serial converter FT232RQ, all these make the GT2560 an ideal option for a 3D printer control board. What’s more, GT2560 can run over 12V to 24V which gives higher torque and higher rotation rate. 1.Integrated with the function of the Arduino Mega2560+Ultimaker and the Mega2560+ramps 1.4 kit, the GT2560 can not only replace them in respect of both software and hardware, but also features compact size, more convenient connection, and is more stable. 2. 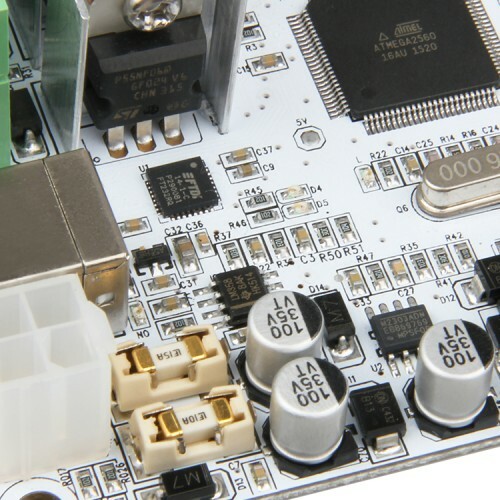 Adopts the ATmega2560 as the main control chip, coupled with the high-performance USB serial converter FT232RQ. 3. Power Supply: the operating voltage is 12V-24V; double power supply design feeds for heatbed and logical part separately. The current is 12A for heatbed and 5A for other parts. The cooling fan can support 12V. 4. The main circuit adopts SMD fuse tube, the diode added to the power port can provide reverse protection to the whole circuit, in addition, the 5V USB is USB port protected with a 500mA recoverable fuse. 5． 3 12v fan outputs and one PWM output for LED or other lighting equipment. 7. 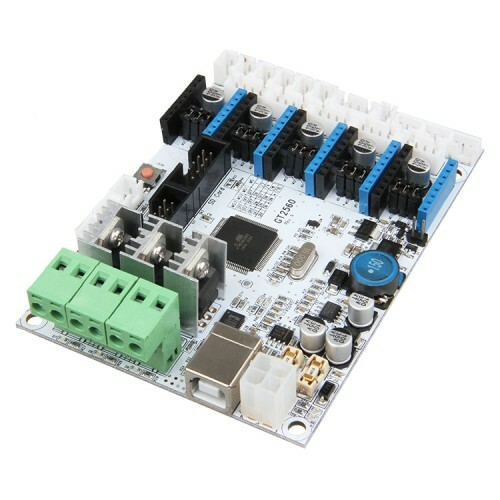 Supports up to 5 A4988 stepper drivers (3 for X/Y/Z axis, and 2 for extruders); the subdivision of stepper motor can be setup by dial switch, eliminating jumper caps, easier to operate. 10. It uses Marlin firmware, which is known for its stability, usability, and high-performance. 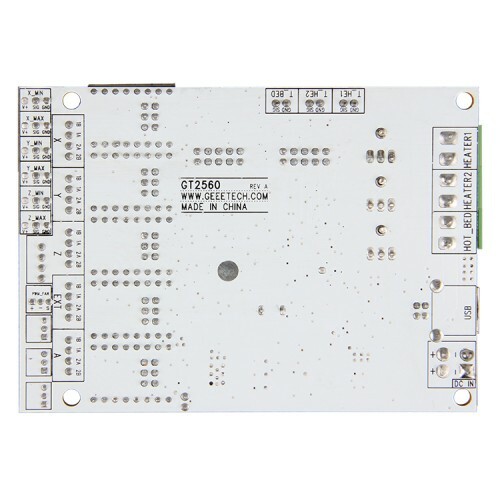 For more information about the GT2560, please refer to the Geetech wiki or the GT2560 user manual.